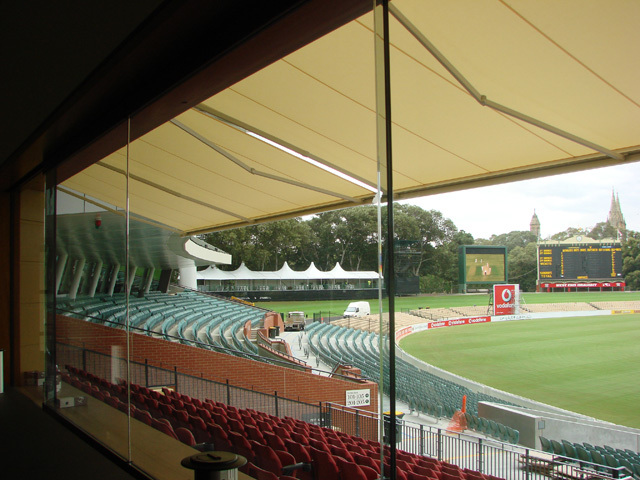 Following the recent upgrade to the Western Grandstand, the South Australian Cricket Association required retractable shade to protect the Giffen Stand pavilion windows and cover part of the member’s area. Shadeform was engaged to install a series of Six Issey Laguna motorized folding arm awnings covering a width of 46 metres. Custom brackets were designed to install the Laguna folding arm awnings to the underside of the pre-cast concrete first level seating deck. A motion sensor unit was installed with each awning to enable automatic retraction if wind speeds pick up within the stadium. 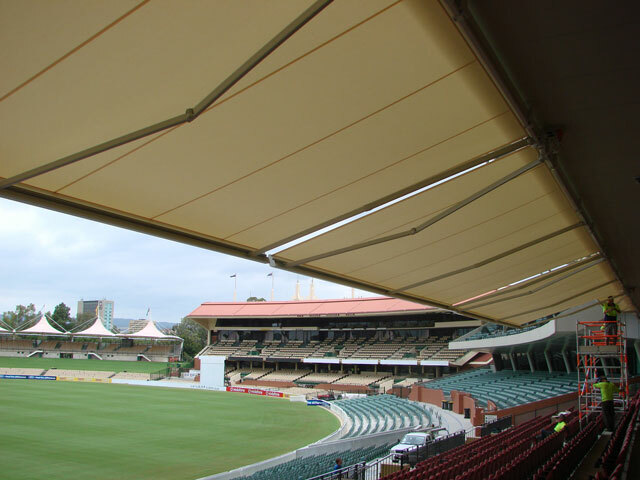 As well providing controllable shading and solar UV protection to the seating area, the Laguna folding arm awning reduces the need for cooling within the Giffen Stand pavilion during the summer months by shading the glass façade. With ‘surf mist’ powdercoated aluminium framework and ‘vanilla’ colour fabric, the awnings create a functional yet aesthetically sympathetic shade solution to this treasured heritage building.